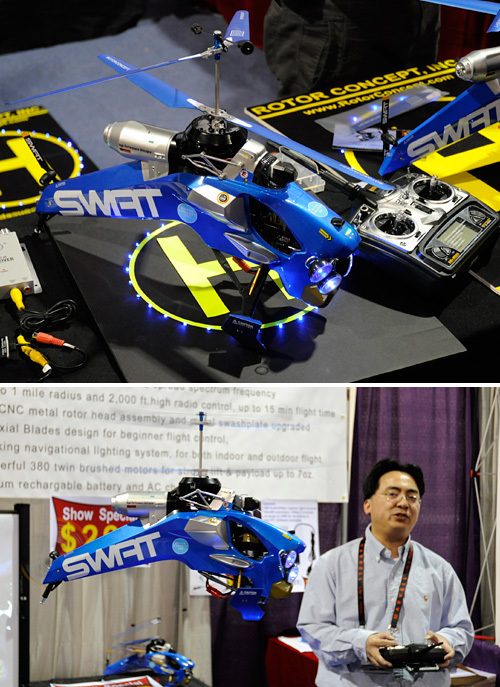 While it looks like one of those professional RC helicopters that should only be controlled by an experienced pilot lest someone loses a limb, the ID1-Swat from Rotor Concept’s actually looks as easy to fly as those palm-sized Air Hogs models. At least the demos at their small booth at CES were impressive since the electric chopper effortlessly hovered in the air, even when there was no one at the controls. Thanks to a “state-of-the-art high performance heading hold gyro” if things start to get out of control you just let go of the sticks and the ID1-Swat will level itself and remain hovering where you left it. Its 11.1V, 1500mAh lithium-polymer battery, which powers two electric motors, is good for about 15 minutes of flight time, and the 4-channel, 2.4GHz remote gives it an impressive flight range of a 1 mile radius and up to 2,000 feet high. And to top it all off there’s even a wireless video camera in the front giving you a first-person view of the entire flight. $499, back-ordered until mid-February. By Andrew Liszewski on 01/11/11 • Leave a comment! 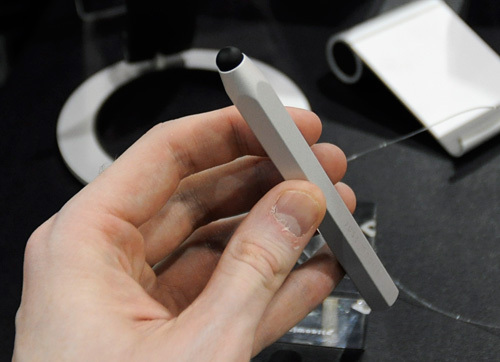 Wandering around the iPod/iPhone/iPad accessory neighborhood of CES I came across this chunky looking touchscreen-friendly stylus that caught me eye. It reminded me of the thick crayons and fat Crayola markers I use to use in grade school, but since it’s made of brushed aluminum I doubt it would pass the ‘kid-friendly’ test these days. But from time to time I’ve pondered taking the iPad for a spin with a stylus, and the soft rubber tip of the AluPen and its overall design put it at the top of my list for possible contenders. It’s also available in black, blue, gold, green and red, for $24.95. 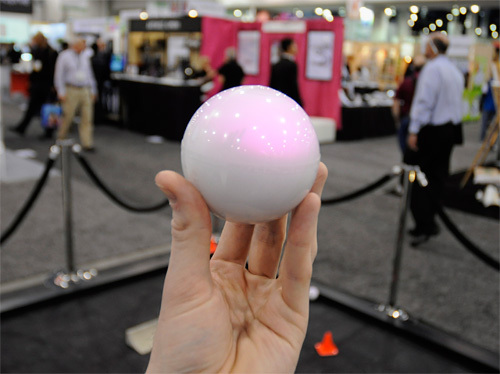 We first brought you news about Sphero around a month before CES 2011 was set to begin, and it immediately became one of the things I was most excited about seeing at the show. And given the amount of time I spent playing with their white plastic ball at their booth, suffice to say it didn’t disappoint. The most common question raised by other attendees while I loitered around the Orbotix booth was “why?” and it’s exactly that question that has me most excited about Sphero. At the moment most people see it as nothing more than an RC toy, but it’s the endless possibilites of what it can also be that I think will be its ‘killer app’. Just like how every day a new app comes along that takes advantage of the iPhone’s capabilities in a unique and interesting way. More of my thoughts and hands-on impressions of Sphero after the jump. 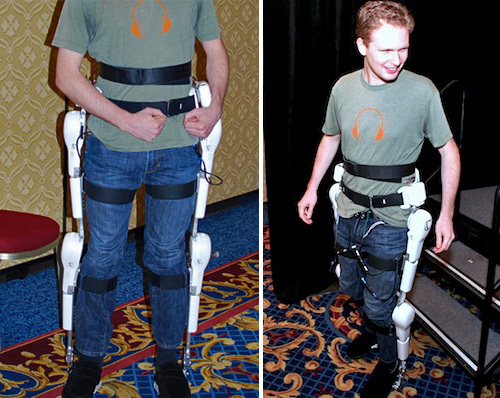 Evan Ackerman, tech-blogger extraordinaire and Senior Editor of BotJunkie, was the first person in the United States to don Cyberdyne’s ‘Hybrid Assistive Limb’ or ‘HAL’ robotic exoskeleton suit. Or more specifically, just the pants. Using four sensors attached to his waist and his thighs the suit reads the signals being sent to Evan’s legs when he wants to walk, but its electronic muscles end up doing all the work for him. The suit is designed to help those who are unable to walk on their own, and as a result has 4 different strength levels. Because Evan is still able to walk they left it at level 1, but according to him it was still remarkably powerful even at the lowest setting. So based on how my legs and feet feel right now after a week roaming the CES show floors, I think I’ll be adding a set of these to my blogging kit for next year. 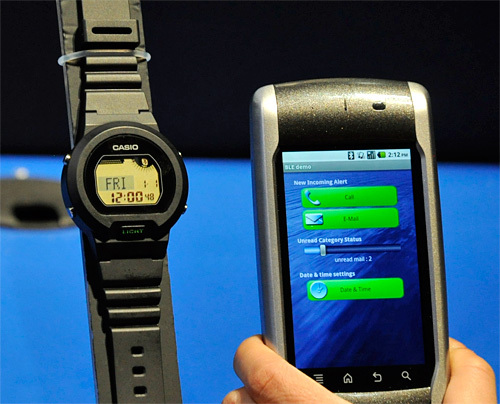 While its current aesthetics leave something to be desired, Casio is definitely on to something with their prototype Bluetooth Low Energy watch designed to communicate with smartphones. It’s not the first watch on the market designed with such functionality, but its BLE technology means that on a single CR2032 cell button battery you’ll get about 2 years of life, assuming it’s communicating with your phone ~12 hours a day. Other wrist-worn devices, while sporting lovely full color LCD displays, require you to charge them on a weekly basis which is simply annoying. Of course functionality is a bit limited as a result, but I think the watch strikes a good balance between battery life and capabilities. A scrolling dot-matrix LCD display provides information on who’s calling, who txt’d or who emailed, and the watch can control or silence alarms and notifications on a smartphone in your pocket by simply tapping its face. There’s even a locator and/or security function that can let you know if your phone has been left behind, or simply help you find it by sounding an alarm. However, as you can see the prototype being demo’d at Casio’s booth was communicating with an Android-based phone since the current limitations with the iPhone and Bluetooth connectivity when it comes to third-party apps once again means that Apple’s offerings might not be able to play nice with these devices that Casio is hoping to get to the market sometime in 2011. 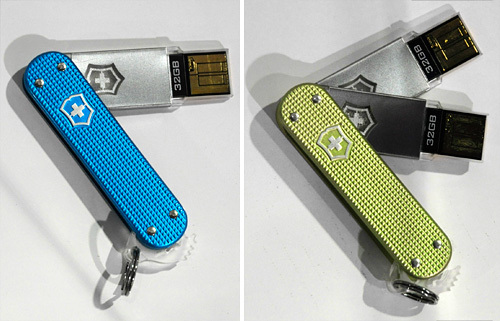 It may not have made headlines like 3D TVs or tablets did at CES this year, but SanDisk, who thankfully skipped a booth for a quiet back-hall private meeting room this year, introduced their new 128GB compact flash cards which for the time being claim the ‘king of the castle’ crown. 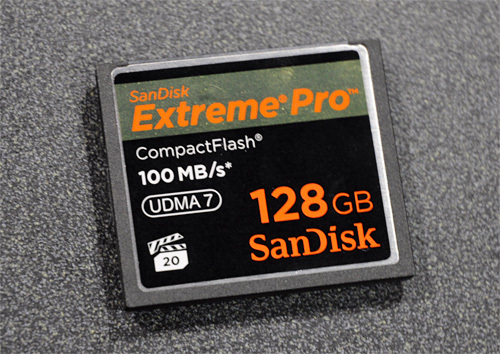 Not only do their Extreme Pro CF cards feature gargantuan capacities, but they’re also now the fastest CF cards on the market with up to 100 megabytes per second write speeds thanks in part to their UDMA-7 interface. The kicker? (You knew this was coming.) Available in the latter part of Q1 2011 for $1,499.99. Looking like some giant, creepy, glowing eyeball plucked from one of Michael Bay’s Transformers abominations, CTA Digital’s PlayStation Move compatible bowling ball accessory makes playing motion-based bowling games on the PS3 extra embarrassing. 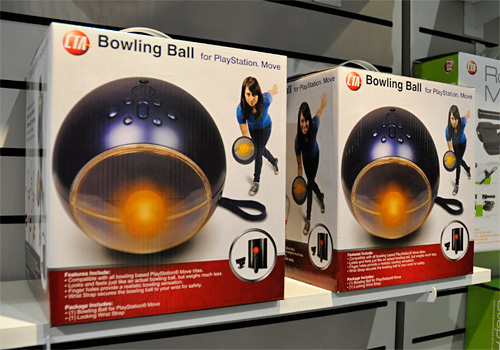 You may remember the company’s first bowling game accessory was released for the Wii a couple of years ago, and now that the other consoles have caught up in terms of motion-based gaming, we can expect to see a lot more accessories like this that were once Wii exclusives. Hooray right? 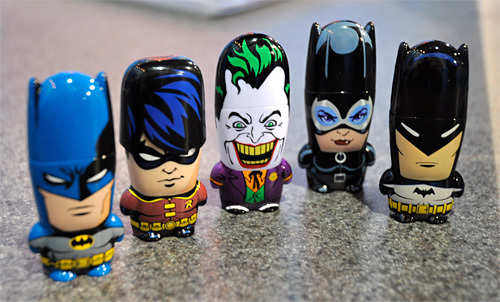 Available sometime in the end of Q1, pricing TBA.